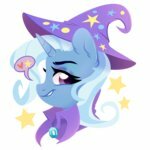 A unicorn who boasts her magical prowess with traveling circus-style, one-man magic shows. 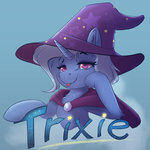 She has a blue body, light blue and white striped hair, purple eyes, a curved moon with a star wand as a cutie mark, and typically wears a purple wizard's hat and cape decorated with stars. Her eyes are notable in that their irises lack the usual stripes and just have the smooth gradients. 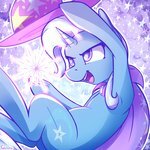 The following tags are aliased to this tag: trixie_lulamoon, trixie.